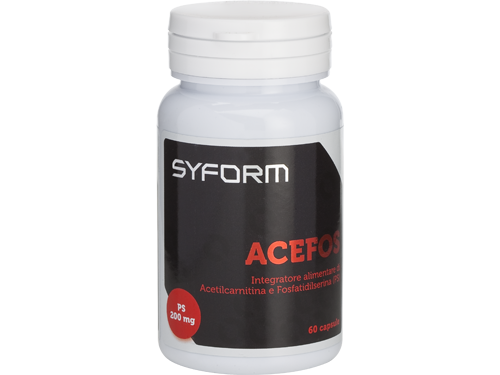 Acefos presents an association of active ingredients whose synergy is very positive in contrasting the physical and mental stress. The Acetyl-carnitine, salt acetylated carnitine, unlike other salts, is able to cross the blood-brain barrier and, in the central nervous system, plays an neuroprotective activity. It is used in the Alzheimer’s treatment, in case of depression, in diabetic neuropathy. During the effort, it increases the availability of energy, favoring the aerobic energy metabolism that uses fat as preferential fuel. The acetyl-carnitine also seems able to promote an increase in the number of receptors for testosterone; is in fact considered to be able to reduce the muscle catabolism (proteolysis) and accelerate recovery in the intense and prolonged effort. Phosphatidylserine, a phospholipid that isn’t present in nature, but indirectly obtained from soy lecithin, is an essential component of biological membranes. It is abundant in the brain, lungs, kidneys, liver, testis. Its regular intake, in a dose of 100 mg, has shown to combat stress conditions and mental fatigue, memory impairment, and to encourage a better energy performance. It’s considered to be able to reduce plasma levels of acth and cortisol, stress hormones. Cortisol is a hormone that “empties the muscles”, but its excessive production also weakens the activity of certain parts of the nervous system. The organism produces it when it is exposed to intense psycho-physical stress, for example during prolonged physical activity. Take 1 cap daily, preferably during main meals. Sportspeople can increase the dose to promote the recovery, up to 4 capsules daily. Acetyl-carnitine HCL, Phosphatidylserine (from Soy), Anticaking: silicon dioxide. Glazing agent (shell): animal gelatine. Contains: gluten, soy and derivated. 60 capsule x 600 mg.